Post updated with newer pics from a recent visit. 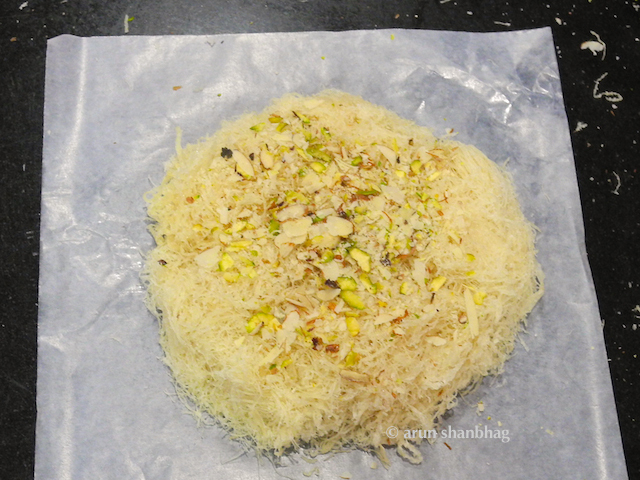 Hope you have all tried Sutarfeni – the sweet, shredded, flaky, rice dough, topped with pista and almonds. What a dangerous agent it is; melts my self-discipline, and like a slobbering idiot I empty a pound of this “buddi ka baal” in no time. Growing up, Parsi Dairy Farm on Princess Street, Mumbai were the purveyors of the best sutarfeni in town. Over the last couple of decades, Dayaram Damodar Mithaiwala, or simply D. Damodar at the Dadar TT Circle has caught up with the hallowed Parsi Dairy. All family and friends swear by D Damodar. The only way to put this controversy to rest was to actually go to both places and try out their sutarfeni. A hazardous task indeed, but someone had to do it. After munching on sutarfeni at both places and washing it down with mitha lassi, the verdict is in. Parsi Dairy Farm is still superb, the queen of indian Desserts. But considering that D Damodar has caught up with Parsi Dairy, it gets the nod! (My post on Parsi Dairy). Yummo Drools…. D Damodar sutarfeni… Lado depo amazing ladoos and vada paav… That one circle and you get all the type of eats one would relish to eat while in India…. I miss Dadar… thanks dear Arun for this post.. Next time I go to Siddhivinayak this is a must stop while returning. Yes, there are so many awesome food places near dadar/Parel. We also found a tiny south indian eatery which became our regular for delicious Kaapi. Hope you guys are doing well; how is Shubha? yes, their sutarfeni is really, really good. drool worthy. Hey can u pls tell me where exactly his shop is ????? Its right on the Dadar TT circle (Khodadad Circle). Along Tilak Rd which goes towards Dadar West; on the South side of that street. Here is their website and more info. Thanks, likewise your site is interesting too! I’m a HUGE Pav Bhaji fan…any thoughts on the best Pav Bhaji in Mumbai? I would love to go to Parsi Dairy in Mumbai – thanks for sharing. Thank you~ You have a nice site. Congratulations. See this post on Parsi Dairy – The Bestest! ps did u chk out anantashram ? You should definitely try Parsi Dairy. Everything they have is fabulous. They also sell the sweet curds in a clay pot – yummy! Anand Ashram? Name sounds familiar. Where? I love Anand Bhavan in King Circle – that’s where I get my stash of PooranPoli, and banana chips. A few places in girgaon make great puranpoli and telpoli too, and i get my superfresh bananachips from a joint behind Panchratna back gate (opera house) also a great khauu galli for gujrati food. Hmmm! You seem to know ALL the right places! Will check these out! Thank you for sharing that V.
it is still the bestest. THank Navin for sharing your thoughts. I have eaten this sweet before. Relatives from Mumbai used to bring it whenever they do a trip to native… I have not seen this being sold anywhere in Kumta / Bangalore / Mysore. Hope you had good memories of sutarfeni! Absolutely Jessie: We need to get you to India and soon. You will be in Heaven. and I need to reply to your email ~ will do sometime this weekend. I recently came to know that it’s Sutarfeni, else was always ‘Buddhi ka baal’ for us. Yum yum yum, I love it! Ha ha! Yes, it was always: Buddi Ka baal, when we were growing up. I think only after I went to college I realized its proper name. I think it is the same as “Pheni” from the South. They serve this without the toppings but instead they pour warm badam and saffron milk over it. We eat it mixed with the milk. Yum! I think I have tried that phenori (?) mainly in South Kanara; yes, eaten with poured badam and saffron milk. Yumm! This is slightly different and more Mumbai. Thank you and hope you are doing well. Never tasted Sutarfeni …it looks like Soanpapdi though. Could it be the same thing? 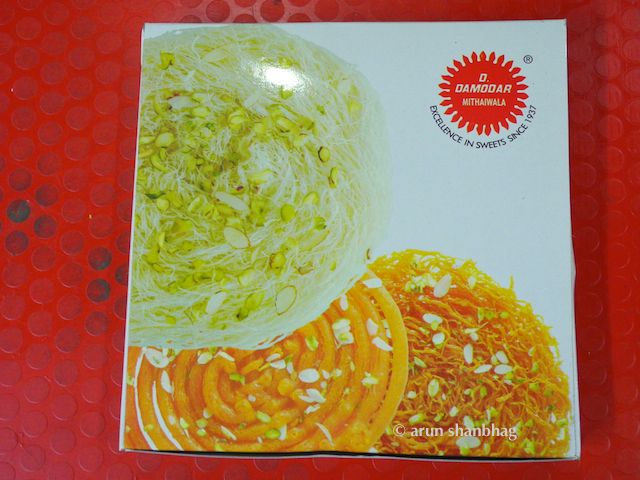 Its amazing how many types of indian desserts we have and how the variety of names for each. I know soan papdi, those are usually finely flaky and compacted in a square. Sutarfeni is definitely different and always served in these large ’rounds.’ The stringy flakes are long and that is why the slang for this is: Buddi ka Baal! ha ha! Also, sutarfeni is NOT as sweet as soan papdi, which means you tend to eat a lot more sutarfeni. And now you will have to find sutarfeni, try it and let us know what you think. O, and now I have it from a reputed source; ie Prachee on facebook. She says that Soan papdi is made from besan (chana dal) flour, while sutarfeni is made from rice flour! Yaay! Now I know too.